Back of the Congressional Gold Medal awarded to the O.S.S. replica with "Halyard"
prominently engraved, displayed in the United States Capitol building in Washington, D.C. on March 21, 2018. Photo courtesy of Dana Maksimovich. 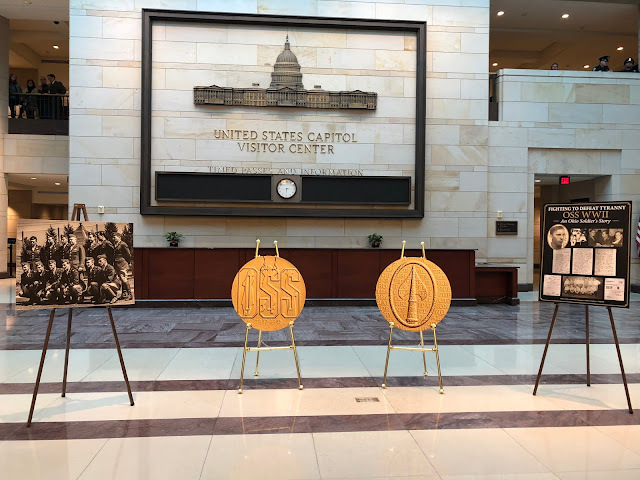 OSS Congressional Gold Medal display in U.S. Capitol Building in Washington, D.C. 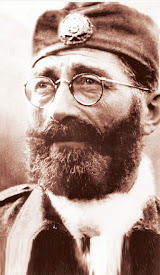 It seems that every positive step in the vindication process for General Draza Mihailovich and his Chetniks and the proper recognitions and honors bestowed takes the long road to fruition. 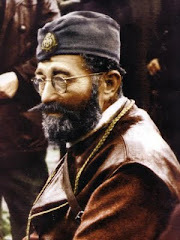 Perhaps it is meant to be that way, but so many of the patriots directly involved in the events that made the Serbian general and his Chetniks a legend in the hearts and minds of those who understand who they were and what they stood and fought for, did not live to see and celebrate the official recognitions and vindications. Fortunately, the descendants and admirers of those who have passed on have continued carrying the torch for their heroes. A long overdue and well-deserved honor was recently bestowed collectively upon the entire group of O.S.S. (Office of Strategic Services) agents in Washington, D.C. with the awarding of the Congressional Gold Medal on March 21, 2018. Among the O.S.S. wartime missions specifically honored with its name being forever engraved on the medal was the Halyard Mission. 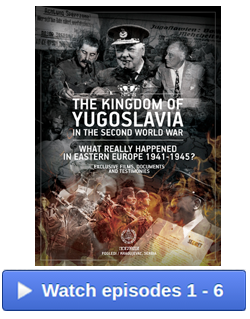 This amazing Rescue Mission of WWII, which took place in the Nazi-occupied areas of the former Yugoslavia, primarily Serbia, with the blessing and invaluable assistance and contributions of General Mihailovich, his Chetniks, the Serbian people loyal to them, and the O.S.S. agents who believed in the Mission and were integral to Washington giving the green light, is the stuff of epic films. No such film has been made to date, which is a travesty in and of itself, but those of us who know the Halyard Mission story continue to hang on to the hope that this goal, too, will finally come to fruition. Then the whole world will know what we know, and will be in awe. The official descriptions of the event can be found in the various news stories that were issued back in March. Some have been published here on this website. This posting highlights a few of the special individuals in whose name their descendants, friends, and admirers made it through one of the worst snow storms of the 2017/2018 winter season to be witnesses to the long-deserved honor. This is their story of an event that none of them will ever forget. 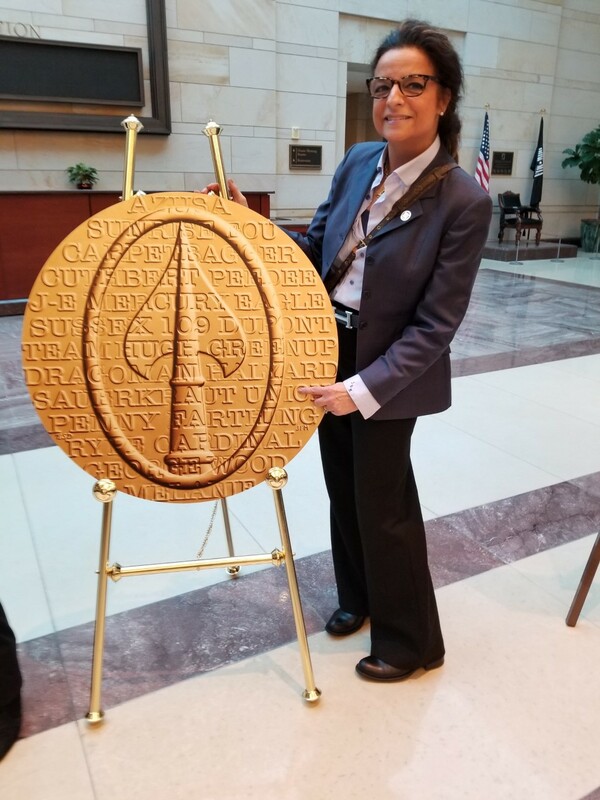 The month of March timing of the Congressional Gold Medal Ceremony was quite appropriate. It was also in March, 70 years ago, in 1948, that the Legion of Merit was posthumously awarded by U.S. President Harry Truman to General Draza Mihailovich for his contribution to the Allied Cause. The O.S.S. agents who made the Halyard Mission possible, some of Serbian heritage, some not, share in the glory of this Legion of Merit award, and though the Mihailovich Medal stayed classified for 20 long years for disingenuous political reasons, the Congressional Gold Medal awarded to the O.S.S. agents will not be hidden. It is my sincere hope that this most recent award will inspire further interest in the Halyard Mission and the men and women who made it possible. They were true heroes, in the truest sense of the word. In recently marking Memorial Day 2018, we were once again reminded of the sacrifices and dangers that the members of the military forces and agents such as those of the O.S.S faced and continue to face virtually every day in war zones. Some survive, some do not. Thankfully, all of the rescued air men and O.S.S. agents that were part of the successful Halyard Mission Rescue Operation were survivors and lived to tell the story to their descendants and anyone who would listen. Not all of them would live to see the vindications, the recognition, and the honors, but that's why it's up to their descendants and the rest of us to carry on. A favorite quote of mine is "A Man's dying is more the survivors' affair than his own" by Thomas Mann. I'm so thankful for the many dedicated "survivors" that have indeed "carried on". No one truly dies until they are forgotten. There is one very special Halyard Mission veteran whose birthday falls on May 29th, always around Memorial Day, who did not live to see much of the progress that has been made in obtaining the proper recognition for the Mission. His name is Major Richard L. Felman of the U.S.A.F., and he died back in November of 1999, long before the Congressional Gold Medal was awarded to the O.S.S. agents who made his rescue possible. I can imagine how over the moon he would have been that those agents, such as Nikola Lalich, George Vujnovich, George Musulin, Arthur Jibilian and others were finally being officially recognized by Washington. I wanted to wait until the Memorial Day time frame to publish this posting in honor of Major Felman's birthday. 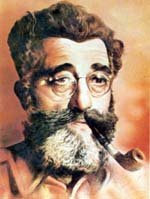 From "Day One" he was relentless in getting the word out about the Halyard Mission, General Mihailovich and his Chetniks, the Serbian people, and the grand and historic events of 1944 that resulted in the saving of over 500 American lives through the efforts of the brave souls who did the right thing in the face of all the obstacles that conspired against them. Lalich, Vujnovich, Musulin, and Jibilian did not live to witness the O.S.S. officially honored in March of 2018 either, but their descendants and friends are here to speak for them. Many thanks to Stephanie Lalich Jones, Xenia Vujnovich Wilkinson, Debi Jibilian, David Vuich, Georgene and Jo Anne Musulin for sharing your impressions and stories of this singular honor that was personally felt very deeply by each of you and will remain in your memories forever. For some of you, the event was bittersweet, and that's understandable. You are the descendants and associates of men who did great and honorable things...who saved lives... who made history. Never forget that. 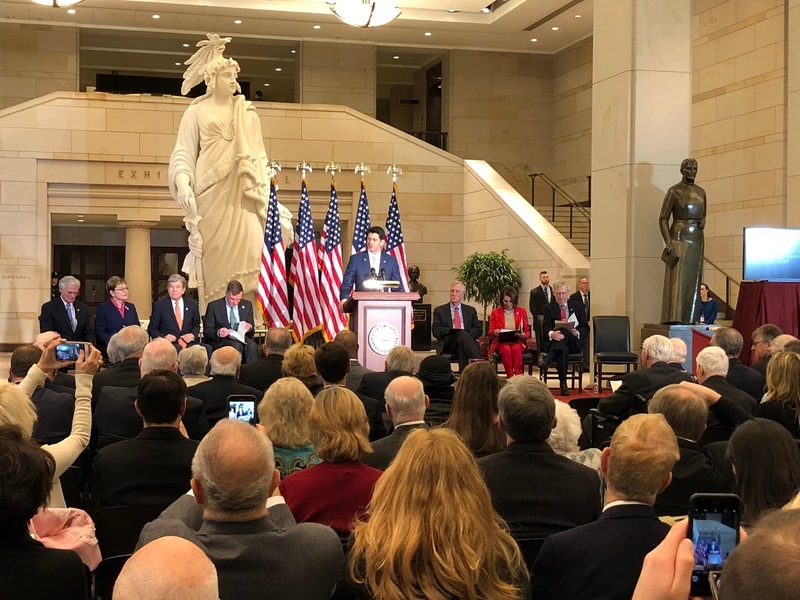 House Speaker Paul Ryan speaking at the OSS Congressional Gold Medal ceremony in the U.S. Capitol Building on March 21, 2018. Presentation of the Congressional Gold Medal to president of The OSS Society, Charles Pinck, in Washington, D.C. March 21, 2018. From left to right: Dana Maksimovich, Ginger and Ginger Vuich, Xenia Vujnovich Wilkinson, Rose, daughter of Stephanie Lalich Jones, and her mother Stephanie at the U.S. Capitol Building in Washington, D.C. for the Congressional Gold Medal ceremony honoring the O.S.S. on March 21, 2018. A late winter snowstorm shut down Washington, D.C. on the first day of spring. The federal government closed, schools were canceled and residents were advised to stay at home. The snow emergency did not deter the presentation of the Congressional Gold Medal at the Capitol to the OSS (Office of Strategic Services), the intelligence and espionage agency established during World War II. Reflecting on the hardships that OSS members endured during the war, I decided that bad weather would not stop me from getting there to represent my late father, George Vujnovich, who organized the OSS Halyard Mission, in which over 500 U.S. and Allied airmen were rescued and evacuated from Nazi-occupied Yugoslavia in 1944. Arriving at Emancipation Hall where the ceremony took place, I was happy to see Stephanie Lalich Jones, daughter of the gallant Captain Nick Lalich, who led the field mission to evacuate the downed airmen who were being sheltered in farmhouses under the protection of Serbian resistance leader General Draza Mihailovich and his forces. Stephanie was accompanied by her two daughters, Caroline and Rose. I also had the pleasure of meeting Georgene Musulin, who attended the ceremony to represent her father, Captain George Musulin, OSS liaison officer with Mihailovich's resistance forces. We were so proud of our fathers and regretted that they did not live to witness this ceremony. Around twenty OSS veterans - all over 90 years old - did attend, arriving in high spirits from different states despite the snowstorm. They are only a remnant of the 13,000 men and women who served in the OSS. Senator, Roy Blunt, Missouri Republican; and Senator Mark Warner, Virginia Democrat. The OSS Society, under the leadership of Charles Pinck, worked diligently to persuade Congress to honor the entire OSS collectively with this medal. After the invocation, the Speaker of the House of Representatives, Paul Ryan, presented the medal to the OSS "on behalf of a very grateful nation." Representative Bob Latta (R. Ohio) followed with eloquent testimony of the bravery shown by his late friend and constituent Arthur Jibilian, radioman for the Halyard Mission rescue team. 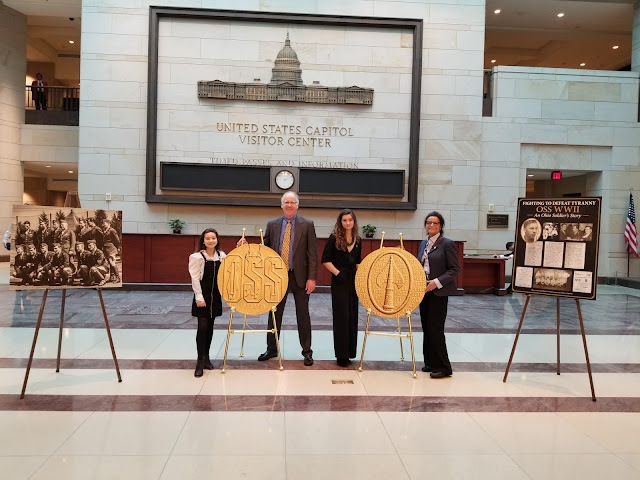 Inspired by Operation Halyard, Congressman Latta became the principal sponsor of legislation to honor OSS veterans with a Congressional Gold Medal. Latta praised Arthur Jibilian, who passed away eight years before the ceremony, for his role in Operation Halyard, in which he participated in an airlift of more than 500 U.S. and Allied personnel who were forced down behind enemy lines in Serbia during World War II. 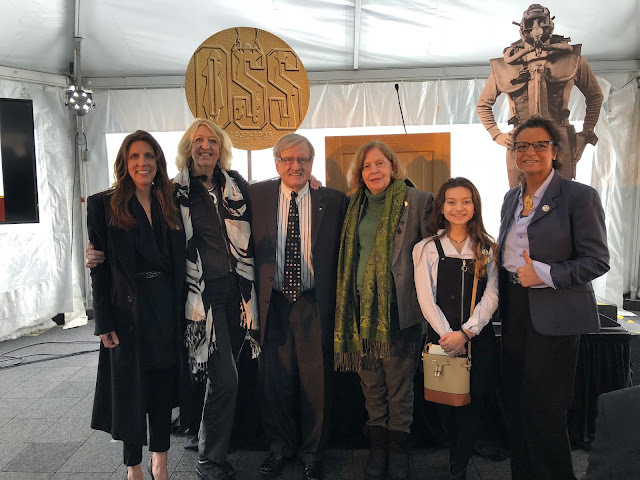 In a bipartisan spirit, the Congressional leadership, including Senate Majority Leader Mitch McConnell and House Democratic Leader Nancy Pelosi spoke at the ceremony to honor the wartime contributions and sacrifices of the men and women of the OSS. A well-attended reception hosted by the OSS Society followed the ceremony. Representatives of the CIA and Special Forces acknowledged that they stood on the shoulders of the OSS. 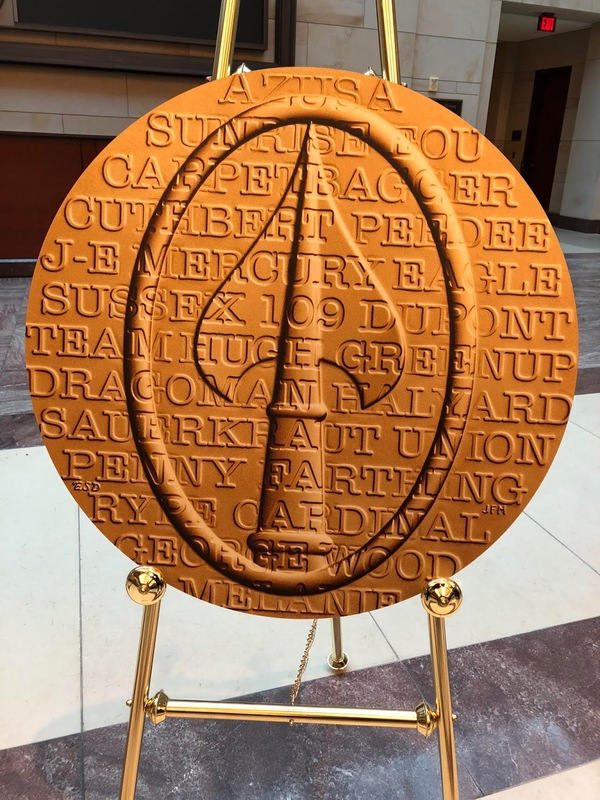 "Halyard" is engraved on the Congressional Gold Medal, along with the names of other important OSS operations and will forever be an official part of American history. 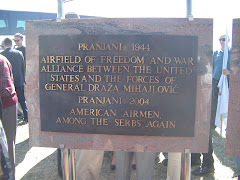 The mission of George Vujnovich, my father, and Nick Lalich, Art Jibilian, George Musulin, Richard Felman and other members of Operation Halyard to tell the story of over 500 airmen shot down over Yugoslavia, their rescue by Draza Mihailovich's resistance forces and local Serbian farmers, and their successful evacuation by the OSS has been accomplished. 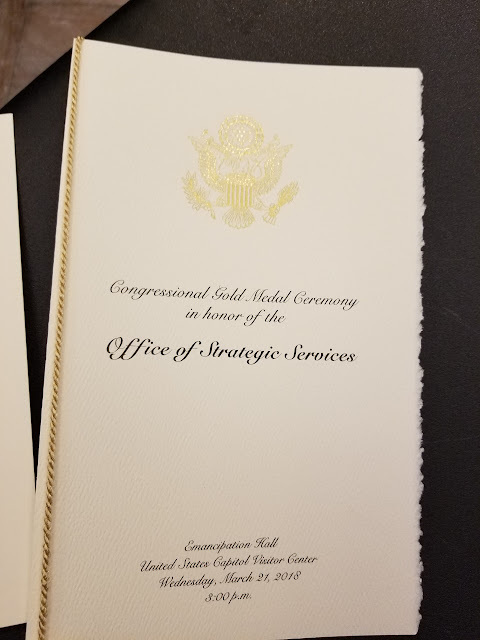 My wife Ginger and I were most fortunate to have been invited to attend a reception at the Capitol Hill Club sponsored by the OSS Society on the evening prior to the formal Gold Medal Ceremony which took place in the US Capitol the following day. architect of the Halyard Mission, and Ms. Dana Maksimovich, Oscar winning film producer from Chicago. We were delighted to meet and chat with many of the remaining elder statesmen of the OSS who were in attendance, to include their families, and one in particular, Mr. Keith Cole from Michigan. During our conversation, we mentioned the Halyard Mission, of which he responded by informing us that not only was he familiar with the Mission, but a member of the C-47 Crew that flew into Pranjane to rescue many of the rescued airmen. He recalled that many of those rescued were removing what warm clothing and shoes they had and tossed them from the aircraft to their rescuers below who were desperately in need of food, clothing, and armaments. 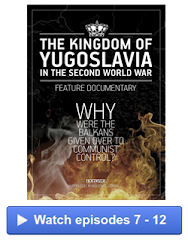 The stories they conveyed was that the remarkable rescue wouldn't have occurred had it not been for the Chetnik forces and Serbian peasants who sacrificed their own survival for them. 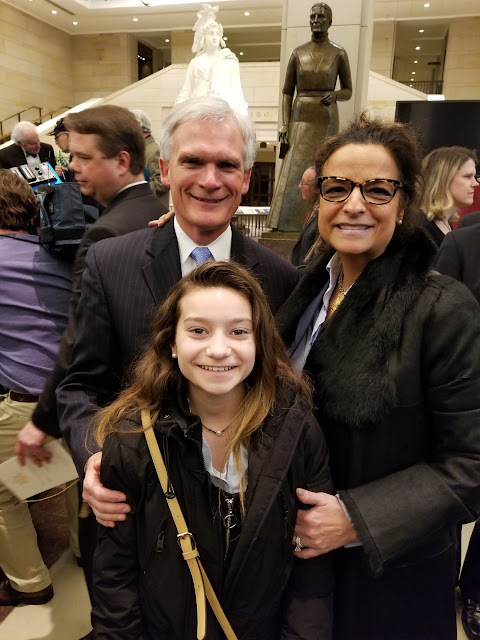 The formal ceremony was conducted at the new "Emancipation Hall" in the new visitor’s center in the Capitol in the midst of a blustery snowstorm, however, the attendance was overwhelming. The event began with the introduction of the Speaker of the House, Paul Ryan, whose remarks were with emphasis on the importance of finally recognizing the brave men and women of the OSS, between 13,000 and 24,000 members of which 3,500 were women who have placed themselves in harm’s way under the most difficult of circumstances in a commitment to overcome our enemies and preserve our freedoms. There were four Senators, including the Majority Leader Mitch McConnell, and five Members of the House, including Speaker Ryan. We were in the company of Stephanie Lalich and her children Caroline and Rose, Xenia Vujnovich, and Georgene Musulin representing their late fathers. Each of the Members of Congress were invited to convey a few words of gratitude to the late and attending members of the OSS for their gallantry, of which several made reference to their personal relationships as friends, relatives and constituents. Congressman Latta of Ohio, specifically made reference to the Halyard Mission, and his late constituent "Jibby" Jibilian. The reference was brief, however, did not make mention of the architects of the mission Nick Lalich, and George Vujnovich, and George “Guv” Musulin of which may have been an unfortunate oversight on the part of the OSS Society organizers. regarding the Halyard Mission, who was delighted and honored to meet the daughter of a key member of the rescue effort. He has conveyed several "Special Orders" on the Floor of the House regarding the Mission, Djordje Sagic, and Nikola Tesla of which we are most grateful. Congressman Poe met with us at the ceremony, however was not invited to participate as a speaker as he was not a member of the Gold Medal governing Committee, however, would have expounded on the Mission due to his in-depth knowledge. We sat next to Congressman Dana Rohrabacher of California who expressed his interest in promoting additional exposure about the Mission. In conclusion, Speaker Ryan made the formal, long overdue, presentation to the members of the OSS, and not to specific individuals as may have been assumed. 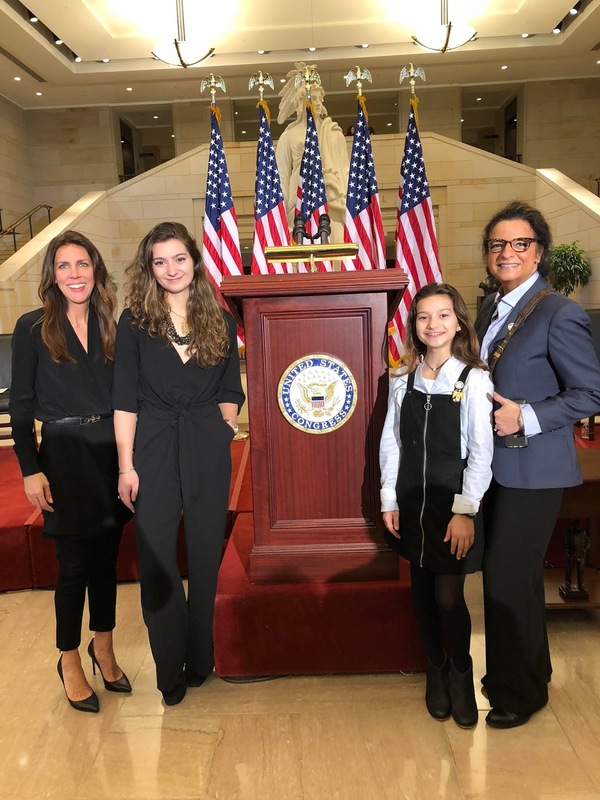 From left to right: Caroline, daughter of Stephanie Lalich Jones, Georgene Musulin Murray, daughter of Captain George "Guv" Musulin, Stephanie Lalich Jones, and her daughter Rose, in the U.S. Capitol Building in Washington D.C. for the presentation of the Congressional Gold Medal to the O.S.S. March 21, 2018. I felt the ceremony was too little, too late. It took 71 years to recognize the people who sacrificed their lives for this country! This is shameful. I would like to think my Dad attended the ceremony in spirit. The weather kept us home... it was so frustrating. The first day of Spring and a snow storm hits us on the day so long anticipated. Georgene [my sister] valiantly made it in, and in her own car at that! It was awesome to see such a turnout — and what more fitting venue than our nation’s Capitol building! The event and site reaffirmed our strong commitment: Lest We Forget. Rep. Latte gave a fitting honor to Arthur “Jibby” Jibilian and Halyard. His and his family’s tireless efforts are rewarded with the gratitude of the OSS Family! The Gold Medal ceremony highlighted the many different heroic missions undertaken by the OSS. Naturally, our connection to the Halyard Mission through our Dad’s role has focused our attention on Halyard. I’m sure I was not the only one to have an a-ha moment to hear vignettes of some of the other nail-biting, history impacting missions, realizing that others share the same pride in their dads’ and moms’ and aunts’ and uncles’ roles through THEIR service in the OSS. For me, the ceremony and the Congressional Gold Medal highlighted the great patriotism and sacrifice of all who serve to defend our country. There are “Halyards” in every war in which we have been and are engaged all over the world. How fortunate and grateful we are that a group of individuals comprising the OSS Society has worked so tirelessly and diligently to preserve those past — and inspire those future — heroic missions — Lest We Forget! I just wish this happened 30 years ago so that our Dad — and many others — could have been in the audience...they would have crawled there in the snow!! Thank YOU and Vera [Dragisich] for your awesome work on behalf of Mihailovich, his Chetnik family, and all the men and women who recognized Draza’s true place in history through their service in WWII and their continued efforts to set the record straight. I am absolutely thrilled that the men and women of the OSS finally received the recognition they have so long deserved! This is a much over-due honor, and I am so sad that I was not able to participate in this historic Ceremony! There was the appropriate pomp and circumstance that I was very concerned would be overlooked in such a presentation, but it was extremely well done! I am particularly happy that there were two receptions to celebrate this Event! As I watched the Ceremony, I was very proud of the "Ohio Connection", with Congresswoman Marci Kaptur describing her "Uncle Tony's" role as an OSS agent, and Congressman Bob Latta describing my Dad's (Art, "Jibby" Jibilian's) exploits in Operation Halyard! However, the former OSS agent who spoke of being an agent, and I am so sorry I didn't get his name, brought tears to my eyes because he was so sincere and his story so poignant! The Ceremony will forever stand out for me because it was almost perfect; with the military band, Congressional Speakers, Hollywood entertainment, and most importantly, the OSS individuals themselves who were able to be there! If only I could have been there, instead of all that darn snow! I don't think that's being selfish - I'd like to have met some of those men and women who were heroes like "Jibby", and hear their stories of what they went through and how they survived! 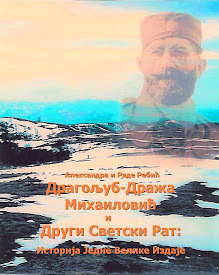 Of course, it might have given me another opportunity to pass on Dad's story about the huge debt we owe the Serbs that has NEVER been repaid or even acknowledged; especially noting the role of General Draza Mahailovich! I still do that every chance I get for him and always will! 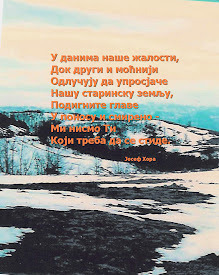 It's the least I can do for both Dad and the Serbs, especially the Serbian friends I've made as a result of his story!! I am truly grateful that this opportunity was available to me, but more than that, I'm so happy that all the men and women of the OSS were finally given their due! It's all about them and the OSS! That's what makes me happiest! This was such an intensely personal experience for us and so rewarding that the OSS folks were finally recognized by the government. What a milestone! Now to finally get recognition for General Mihailovich...and the circle will finally be completed and Dad's dream a reality!!! Left to right: Rose, daughter of Stephanie Lalich Jones, Craig Jones, Caroline, daughter of Stephanie, and Stephanie in the lobby of the U.S. Capitol Visitor Center in Washington, D.C. for the Congressional Gold Medal ceremony honoring the O.S.S. on March 21, 2018. 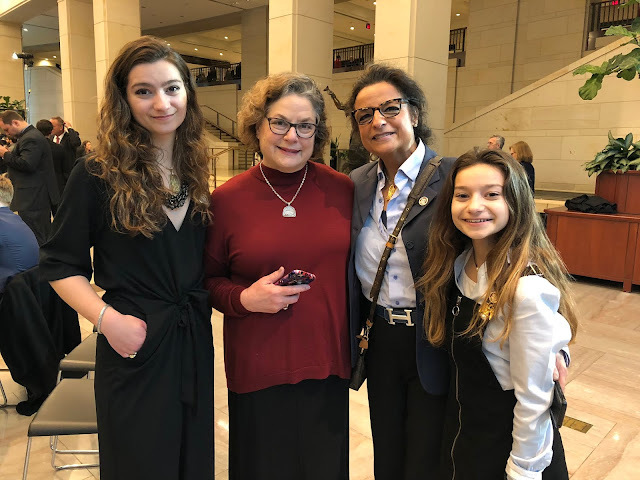 Left to right: Dana Maksimovich, Caroline and Rose, daughters of Stephanie Lalich Jones, and Stephanie in the U.S. Capitol Building for the Congressional Gold Medal ceremony honoring the O.S.S. March 2018. Photo courtesy of Dana Maksimovich. 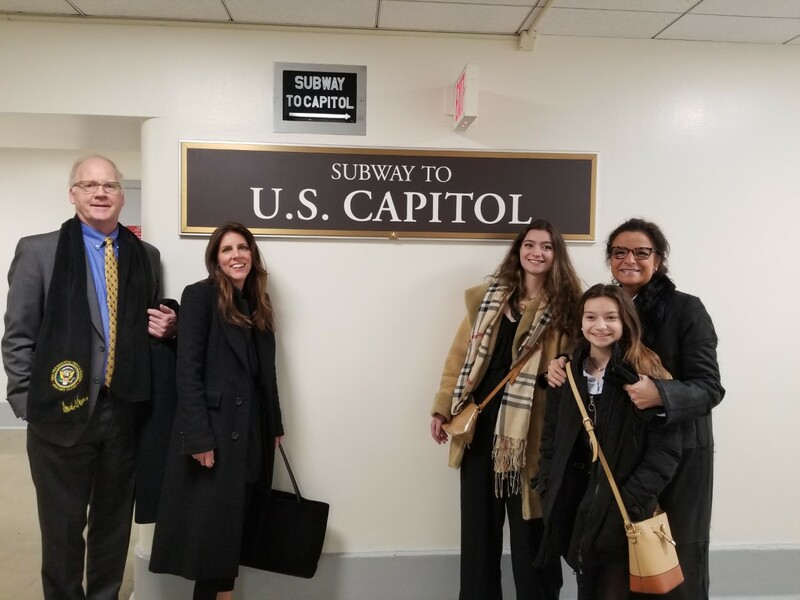 Left to right: Craig Jones, husband of Stephanie Lalich Jones, Dana Maksimovich, SLJ's daughter Caroline and Rose, and Stephanie in the subway in Washington, D.C. on the way to the U.S. Capitol Building for the Congressional Gold Medal ceremony honoring the O.S.S. March 21, 2018. Photo courtesy of Stephanie Lalich Jones. in the U.S. Capitol Building March 2018 for the Congressional Gold Medal ceremony honoring the O.S.S. 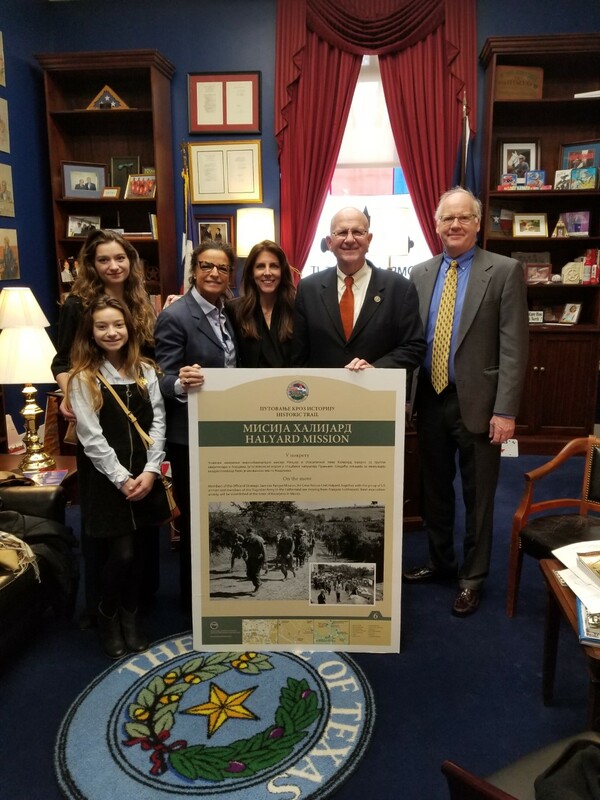 Stephanie Lalich Jones with daughters Caroline and Rose, husband Craig Jones, and Dana Maksimovich, with Congressman Ted Poe (R) Texas, in his office in the U.S. Capitol Building, March 2018. "Through the Eyes of Babes"
A personal story by Stephanie Lalich Jones about her father, O.S.S. Captain Nick Lalich, leader of the Halyard Mission. This story is dedicated to David and Ginger Vuich for their friendship and love and support for my father and my family. We had all long anticipated March 21st 2018, the day the Congressional Gold Medal of Honor would be presented to the O.S.S. Society. For so many years growing up, I was told by my father of his experiences in WWII in Yugoslavia, and the Halyard Mission. He always raved about General Draza Mihailovich, Mike Rajacic, Guv Musulin, George Vujnovic, Eli Popovich, Art Jibilian, and of course, J. B Allin, the photographer. My Dad loved photography... Sometimes I thought he was the actual photographer on the mission, given how many photos he had in his extensive collection. 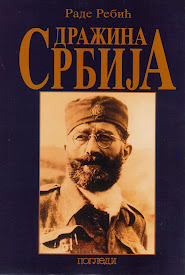 The Serbian audiences crowded in venues of all kinds to hear him tell his stories... how the Serbian people gave up their houses, their clothing, and their food to shelter our U.S. airmen from the enemy. 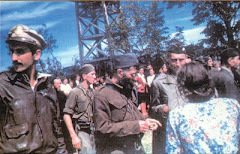 He was like a rock star with the Serbian people. He had this huge fan base that flocked around him wherever he went. “NIKOLA LALICH! !” they would shout in Serbian. They'd smile and give him big masculine bear hugs, and of course, the traditional three kisses on the cheeks. He was larger than life... A true character that you could never forget once you had met him... My father reminded the Serbian people how truly wonderful and big hearted they were. If it were not for them, there could not have been the most successful air rescue mission of WWII. 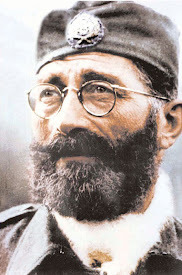 He made the Serbian people happy and proud. He would drink Rakija and Schlivo with them and remind them of their importance and big hearts... And they truly are the people with the biggest hearts. Books were written, documentaries were made... The memory of the Halyard Mission lived on and became greater and greater every year... but all now without my father's voice. Fast forward to late 2016... Right before President Trump took office, President Obama signed into law the bill to grant the O.S.S its long overdue and well-deserved honor - bestowing upon it the Congressional Gold Medal of Honor. That early morning of March 21st 2018 reminded me of the days in Pranjane, Serbia that my father would talk about. We were on a pilgrimage, a mission of our own. It was cold and snowing, yet nothing stopped us. We just forged forward without fear... like on auto pilot. With no trains running out of Baltimore to D.C. we drove in treacherous travel conditions like I had not been through in many years. It was all to get to the nation’s capital and the Capitol building. Nothing would stop us now. Meeting with Congressman Ted Poe (R) of Texas was our first stop. Thanks to David Vuich, my father’s dearest friend, for setting up a visit for us. We were privileged and grateful to share some special time with him before the Medal ceremony... He graciously invited me, Caroline, Rose, Craig and Dana Maksimovich into his private chamber. Dana Maksimovich, who is a Serbian-American, Hollywood Academy Award winning executive producer of the movie “Crash” in 2006, has been diligently working for the past 10 years on bringing a feature film to the big screen on the Halyard Mission. I got a special invitation from the O.S.S. Society for her to join us from Chicago. As the ceremony progressed, everyone made the traditional speeches, the band played, the National Anthem played, the people schmoozed, all the characters did what was expected and appropriate of them. SOP - Standard Operating Procedure, just like in the OSS... perfect protocol... perfectly staged. There was never only one hero of the O.S.S. There was never only one hero of the Halyard Mission. They were a team… a family... a brotherhood. They fought, they saved, they laughed, but most of all they succeeded, and saved over 500 American lives together and then went home to safety. Except for Draza, who, when my father was leaving on the final plane out, begging and pleading with Draza to get on the plane with him to safety, said he must stay and never leave his country no matter what the consequences. Draza then tore the patch off his uniform and handed it to my father along with his prized Kama as an uspomena, a remembrance… There, they bid farewell forever. My father and Jibby, his dedicated radio communications operator, were last to board the plane and leave the mountains of Yugoslavia. The Serbian people bid them farewell with tears in their eyes. The Halyard Mission was over. Memory Eternal... God Bless the O.S.S. and all its heroes... My father's contribution to the Halyard Rescue Mission was just a small part of the magnitude of the O.S.S., but to him it was a journey that he would never forget. And now, no one will ever forget the Halyard Mission. Stephanie Lalich Jones pointing to the "Halyard" engraving on the O.S.S. Washington, D.C. March 21, 2018. Rose, the daughter of Stephanie Lalich Jones and granddaughter of O.S.S. Captain Nick Lalich, in the U.S. Capitol Building for the Congressional Gold Medal ceremony honoring the O.S.S. March 21, 2018. 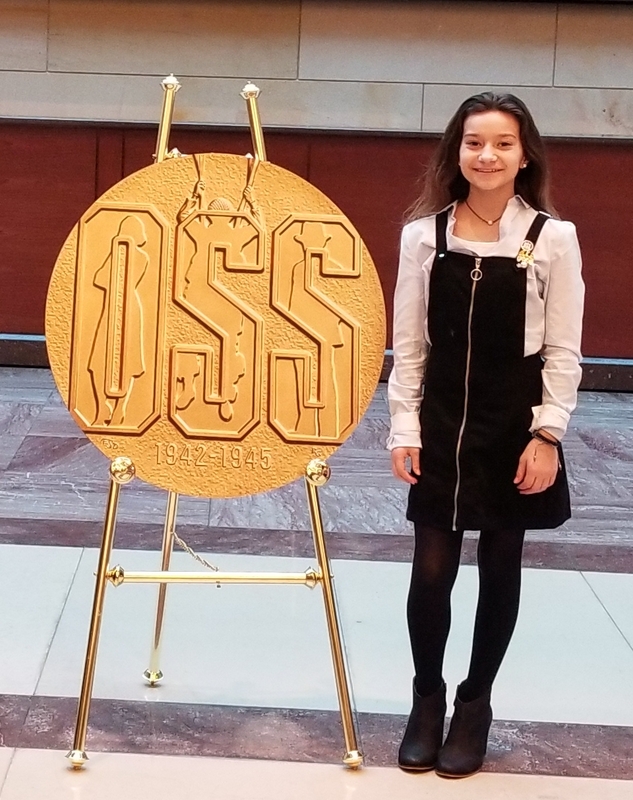 I just wanted to let you know that Rose told the class today all about her grandfather [Nick Lalich], his accomplishments with the OSS, and the award that he received on Wednesday. She was so excited to share this with the class; it was very clear that (although she did not meet her grandfather) she is very proud of him. Thanks for sending such a wonderful student to Dumbarton! She truly is a gem to teach! in honor of the Office of Strategic Services in March 2018.